Listen, I'm a simple man with not so simple interests. This anime ticks many boxes in one fell swoop that I'd otherwise have to have piecemeal. GIve me the monster. Give me the happy, domestic relationship. Give me the effeminate boys. This anime is the full package for me, and the only downfall is that it's only 3 minutes of happiness per week. I've been reading these reviews and a select few ramble on about how there is no plot. I don't think these 3-minute clips need that. They're addicting and cute. That is all I need. The artwork is decent and the scenes are sprinkled with some humor. I don't see why y'all complaining so much. Short and Sweet, and I Liked it! The epoides are not long at all. So catching up on the series was done in less than 15min when 3 eps were out ! Considering how short they are, I'm surprised how much I love the show already. I want more and more! I honestly get more fulfillment out of these cute short skits than I do out of most anime. This is an adaptation of a 4koma comic, and thus is pretty much all short skits without much room for filler or explanation. There's a bunch of people in school and they are the wives of various non-human creatures, and that's just how it is. Episodes are only 3 minutes, 30 seconds of which is theme song, so it bounces quickly from scenario to scenario, lingering just long enough to establish something cute. The exception is the first episode, which was 90 seconds of setup, 90 seconds of theme song, and 0 seconds of jokes; a lot of the negative reviews on this are from people who just saw that and nothing else, which to me seems like not enough to judge the show but i do understand that it didn't exactly put its best foot forward. It's nothing too deep, but Jingai-san no Yome is pleasant and doesn't waste your time, and sometimes that's just what you need. And, I definitely want to fall asleep in Kanenogi-san's fluff. Please just give it a chance! It looks a little weird at first, yeah, but once you put that all behind you and just enjoy all of the fluffy-adorableness thats going on its actually really cute. The development of the side characters and their husbands is just as cute as the main characters development, overall its just an enjoyable experience. It's cute. It's weird. It's short form forces you to just roll with the weirdness of the premise instead of questioning it too deeply (much to it's advantage in my opinion). Also, I found a lot of the weirdness funny. Watch it, enjoy it for what it is, and move on. This show was the cutest show I have set my eyes on. There are people saying that it has no plot in the episodes, but it doesn't need to have one. 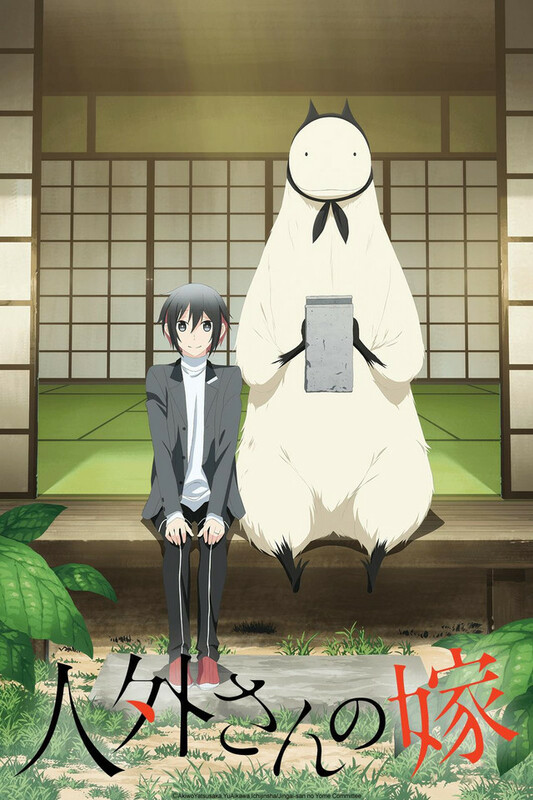 This show may seem weird to a few people but you should realize that this is an anime, and it is a very good one. To sum up this whole review, THIS SHOW IS SOOO CUTE YOU SHOULD WATCH IT. And as a plus, its funny in some parts. Also, 10/10 would recommend episode 10 it's my fav. It doesn't have to make sense! Too many people are judging this show by how weird and nonsensical it is... but is that truly a bad thing? I watched the first ep on a whim, and found that I was still sitting here when I got to the last one. While the concept really doesn't make any sense and can be questionable in more ways than one, the show is soft and cute and heart-warming(???) in it's own way (I think?? ), and well... yeah! It's cute! What else do you need? Each episode is only 3 minutes long, so you don't need to think too hard about it! Seeing a boy fall deeply in love with a large furred creature from another realm in a society where monsters marrying middle-schoolers is seen as normal... well...... the execution is cute and wholesome, so I'm just gonna let some of these points slide. As strange as it is, it's cute! I'm not gonna try to analyze any of this or try to think up explanations for anything, since clearly this is a show meant to be consumed without any critical thinking! It seems that a bipedal hornless mountain goat, pink pig-tanuki football, and an enchanted ACE wrap bandage are allowed or encouraged or whatever to take a boy as a spouse. In the world of anime, where weird is the norm, this is very, very, weird. Only 3 minutes though.